NTPM's results came out basically consistent with the recent quarters. What is seen to be where the paper products are experiencing a tapering off in its margin as well as revenue growth have been offset by the growth in the personal care products. Its revenue grew by about 7% while PBT improved by 13.5%. Based on the 6-years report as below, it is yet to see the good days of FYE2011 and FYE2010, presumably due to the much competitive environment especially from its main challenger, Kimberley-Clark which is doing very well globally over the years. Basically, the surprising thing about NTPM is the success seen from its baby diapers products, Diapex - which I would call a mid level priced products in the local market. From its announcement, it attributed the growth in both revenue and profits from its improved sales in the baby diapers segment. One should note that a few years ago, NTPM was not even producing baby diapers but were distributing for another company, fearing that the business of baby diapers were very competitive. Looking at the number of competitors, this segment is definitely competitive with several main players being Kimberley Clark in Huggies, SCA for Drypers and Unicharm distributing Mamy-Poko. I would even dare to call it that the originator of the product, Pampers by P&G is not even strong among those of the Malaysian market players. However, looking at NTPM that it is able to make a breakthrough in the baby diapers business is a good sign as there is even much more stickiness in this segment than maybe even tissue papers. I notice it has spent quite a huge sum of money marketing its Diapex brand, and in fact I fear that the strategy may not be the right one, but it proof me otherwise. Once it has built that momentum, I think NTPM should be OK for its personal care segment. Products for adults, one can still change but for products for babies, parents are more careful and picky. Once one uses a product which they are comfortable with, the likelihood to continue using would be much higher. Its Diapex brand has a long way to go to reach where it has reached in the tissue papers products, but the important thing about NTPM now is that it is no longer a one product company, with personal care contributing a significant portion of its revenue. 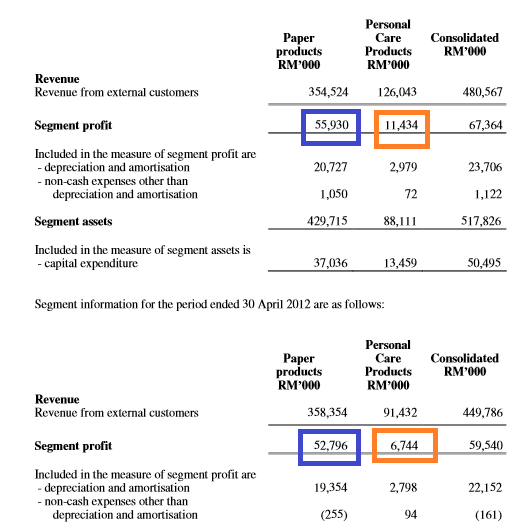 For the tissue products, one should know that NTPM is already a leading player in Malaysia and it is quite hard to unseat the company despite the competitiveness. On its growth, it is seen to spend quite a huge sum on expansion. I would think a lot of money has been put in for Vietnam as well as its warehouse operations locally. One can read on its expansion plans here. On dividends, it has proposed a 1.45%, adding to the earlier 1.45% this year, that comes to total about 5.4% yield based on the current price of RM0.545. Not bad at all. Looking at NTPM, despite the average growth and continuous competition, I am still very comfortable with this company - both on its positioning and future growth. where do you get the statistics of sales rankings in the tissue products' segment and the baby diaper's segment? How much do you think its women sanitary care product form part of its Personal Care segment? If I am not wrong, it has been quite successful in growing this market with its "Intimate" brand. However, I am not keen on its acquisition of the former Union Paper manufacturing operations in Pahang. I think they are still trying to turn around this operation and to make it as efficient as its Nibong Tebal operations. I think it is small. Now the main growth segment is baby diapers. Trading Thoughts: What's brewing at Salcon??? Is there success in Success Transformer? 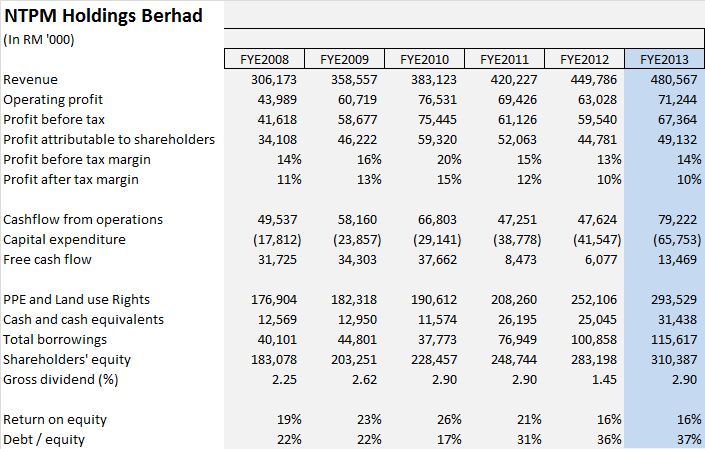 When a FBM KLCI company has its shares cornered?